The written content, images and video on this website and our Facebook Page, Wemyss Private Railway are © of Jim Hamilton, unless otherwise indicated. Any material that we do not own the copyright, will be credited, where possible. If we have used such material we will endeavour to give an appropriate credit. If however we can not find an appropriate credit, we will use the material with the understanding that if the owner contacts us, then we would ask to have their permission to use such material, giving them the appropriate credit and links to other images that they may be displaying on the web. If permission is not given we will remove their item(s) from the website/facebook page. The aim of this website / facebook page, is to share and exchange information freely. Therefore, it is not our aim to stifle information exchange. If you wish to download and publish any written, photo or video content from the website or facebook page, you must first have permission in writing and accept any conditions attached. Please e-mail in the first instance giving an indication of what you want to use, where and how the requested content will be used. Please wait till you receive a written reply. All material must include an appropriate credit, the logo below and link to this website. It is safe to say that everything on this site is copyrighted. 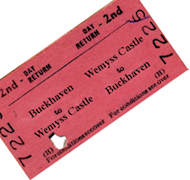 It either belongs to the Wemyss Private Railway web site or it belongs to someone else. (i.e., someone who has donated their written work, images or video to the site). You must contact me by e-mail in the first instance. Permission will only be given in writing.